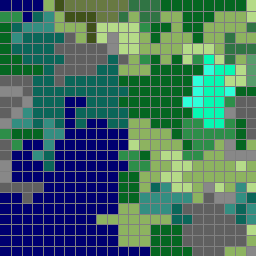 This article explains the principles behind the terrain generator in Cuberite. It is not strictly specific to Cuberite, though, it can be viewed as a generic guide to various terrain-generating algorithms, with specific implementation notes regarding Cuberite. The nature has many complicated geological, physical and biological processes working on all scales from microscopic to planet-wide scale, that have shaped the terrain into what we see today. The tectonic plates collide, push mountain ranges up and ocean trenches down. Erosion dulls the sharp shapes. Plantlife takes over to further change the overall look of the world. Generally speaking, the processes take what's there and change it. Unlike computer generating, which usually creates a finished terrain from scratch, or maybe with only a few iterations. It would be unfeasible for software to emulate all the natural processes in enough detail to provide world generation for a game, mainly because in the nature everything interacts with everything. If a mountain range rises, it changes the way that the precipitation is carried by the wind to the lands beyond the mountains, thus changing the erosion rate there and the vegetation type. The generator must be able to generate terrain in small chunks. This means it must be possible to generate each of the chunks separately, without dependencies on the neighboring chunks. Note that this doesn't mean chunks cannot coordinate together, it means that "a tree in one chunk cannot ask if there's a building in the neighbor chunk", simply because the neighbor chunk may not be generated yet. The generated chunk needs to be the same if re-generated. This property is not exactly required, but it makes available several techniques that wouldn't be possible otherwise. The generator needs to be reasonably fast. For a server application this means at least some 20 chunks per second for chunks close to each other, and 5 chunks per second for distant chunks. The reason for this distinction will be discussed later. As already mentioned, the nature works basically by generating raw terrain composition, then "applying" erosion, vegetation and finally this leads to biomes being formed. 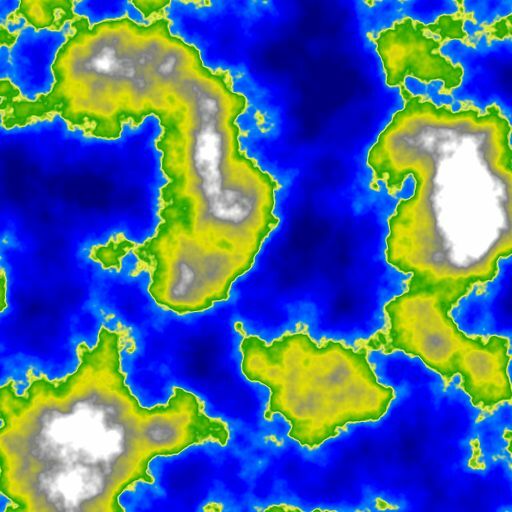 Let's now try a somewhat inverse approach: First generate biomes, then fit them with appropriate terrain, and finally cover in vegetation and all the other stuff. Splitting the parts like this suddenly makes it possible to create a generator with the required properties. 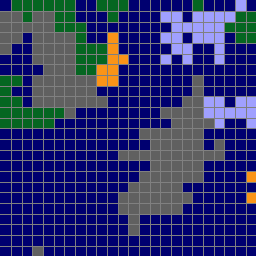 We can generate a reasonable biome map chunk-wise, independently of all the other data. Once we have the biomes, we can compose the terrain for the chunk by using the biome data for the chunk, and possibly even for neighboring chunks. Note that we're not breaking the first property, the biomes can be generated separately so a neighboring chunk's biome map can be generated without the need for the entire neighboring chunk to be present. Similarly, once we have the terrain composition for a chunk, we can generate all the vegetation and structures in it, and those can again use the terrain composition in neighboring chunks. The beautiful thing about this is that the individual components can be changed independently. You can have 5 biome generators and 3 height generators and you can let the users mix'n'match. This pipeline had been used in Cuberite for about a year, before we realized that is has a flaw: There is no way for it to generate overhangs. We tried to implement a Finisher that would actually carve overhangs into the terrain; this approach has several problems, most severe one of those is that tree and village generation becomes unbelievably difficult - those finishers need to know the basic terrain composition of the neighboring chunks in order to generate, and the composition would be different after the overhangs are carved. So we need to come up with a better way, something that directly generates the overhangs at latest by the Terrain composition stage. This way we can have generators that produce overhangs and yet allow finishers that need the entire composition of the neighboring chunks. However, we pay the price for this in performance, because a 3D noise for the density map needs order of magnitude more CPU cycles than 2D noise for heightmap. Also the RAM usage is increased because instead of storing 16 * 16 height values we need to store 16 * 256 * 16 density values. 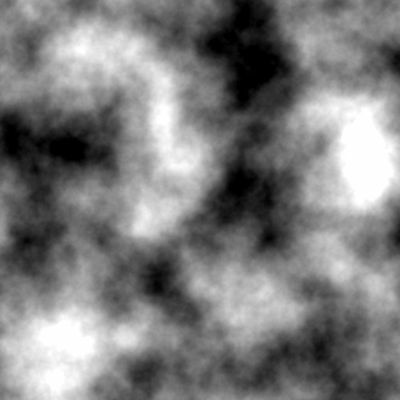 For a great tutorial on coherent noise, see the LibNoise documentation. 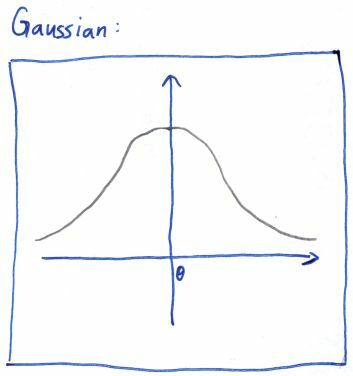 The noise is algorithmically generated, which means that the same data is generated when the same inputs are given to the noise functions. However, this is not the only use for this noise, and 2 dimensions is not the limit - this noise can be generated for any number of dimensions. The easiest way to generate biomes is to not generate them at all - simply assign a single constant biome to everywhere. And indeed there are times when this kind of "generator" is useful - for the MineCraft's Flat world type, or for testing purposes, or for tematic maps. In Cuberite, this is exactly what the Constant biome generator does. 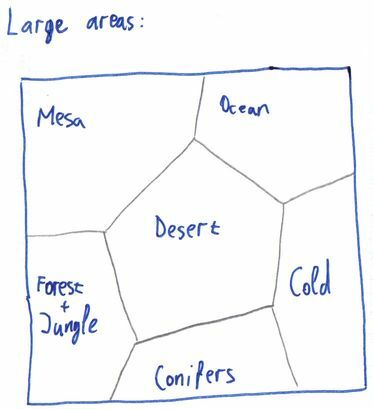 Of course, there are more interesting test scenarios for which multiple biomes must be generated as easy as possible. 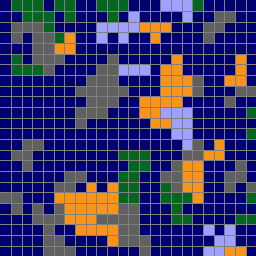 For these special needs, there's a CheckerBoard biome generator. 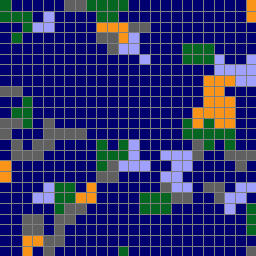 As the name suggests, it generates a grid of alternating biomes. To generate biomes using this approach, you select random "seeds", assign a biome to each one, and then for each "column" of the world you find the seed that is the nearest to that column, and use that seed's biome. 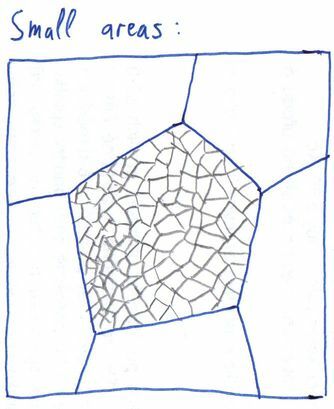 The overall shape of a Voronoi diagram is governed by the placement of the seeds. 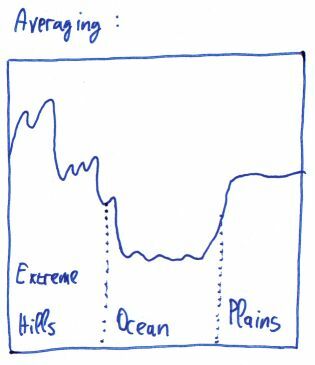 In extreme cases, a seed could affect the entire diagram, which is what we don't want - we need our locality, so that we can generate a chunk's worth of biome data. 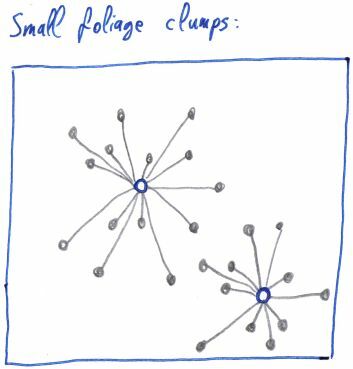 We also don't want the too much irregular diagrams that are produced when the seeds are in small clusters. We need our seeds to come in random, yet somewhat uniform fashion. 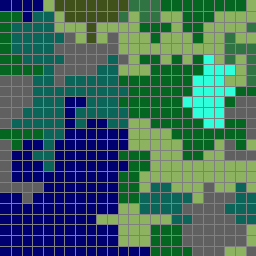 Such a grid is the ideal seed source for a Voronoi biome generator, because not only are the Voronoi cells "reasonable", but the seed placement's effect on the diagram is localized - each pixel in the diagram depends on at most 4 x 4 seeds around it. In the following picture, the seed for the requested point (blue) must be within the indicated circle. Even the second-nearest seed, which we will need later, is inside that circle. 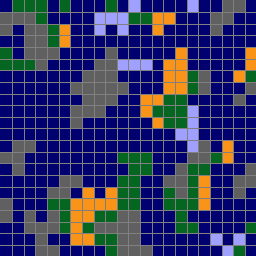 Calculating the jitter for each cell can be done easily by using a 2D Perlin noise for each coord. We calculate the noise's value at [X, Z], which gives us a number in the range [-1; 1]. We then multiply the number by N / 2, this gives us the required range of [-N / 2, +N / 2]. Adding this number to the X coord gives us the seed's X position. We use another Perlin noise and the same calculation for the Z coord of the seed. The biomes are starting to look interesting, but now they have straight-line borders, which looks rather weird and the players will most likely notice very soon. We need to somehow distort the borders to make them look more natural. By far the easiest way to achieve that is to use a little trick: When the generator is asked for the biome at column [X, Z], instead of calculating the Voronoi biome for column [X, Z], we first calculate a random offset for each coord, and add it to the coordinates. So the generator actually responds with the biome for [X + rndX, Z + rndZ]. There's no way to limit the neighbors. A desert biome can neighbor a tundra biome. All the biomes are considered equal. There's no way to make oceans larger. A mushroom biome is generated right next to other land biomes. Our next goal is to remove the first defect of the distorted Voronoi generator: unrelated biomes generating next to each other. You are highly unlikely to find a jungle biome next to a desert biome in the real world, so we want to have as few of those borders as possible in our generator, too. 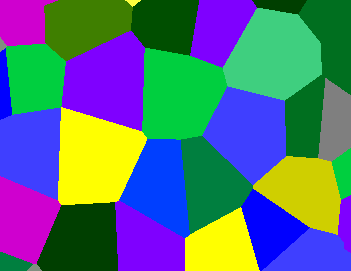 We could further improve on the selection of biome-to-seed in the Voronoi generator. Or we can try a completely different idea altogether. Recall how we talked about the nature, where the biomes are formed by the specific conditions of a place. What if we could make a similar dependency, but without the terrain? It turns out this is possible rather easily - instead of depending on the terrain, we choose two completely artificial measures. Let's call them Temperature and Humidity. If we knew the temperature of the place, we know what set of biomes are possible for such temperatures - we won't place deserts in the cold and tundra in the hot anymore. 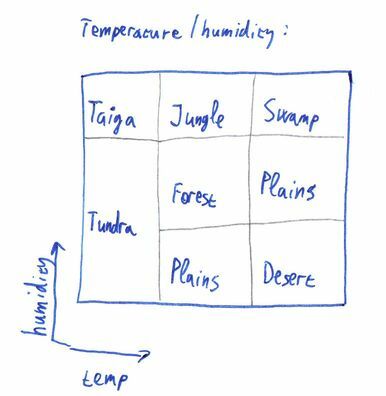 Similarly, the humidity will help us sort out the desert vs jungle issue. But how do we get a temperature and humidity? Once again, the Perlin noise comes to the rescue. 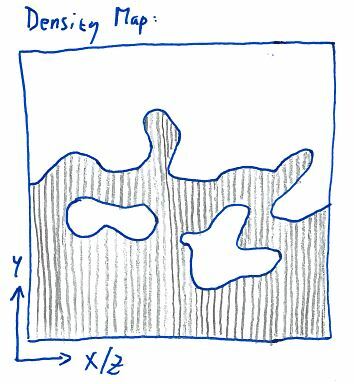 We can use a simple 2D Perlin noise as the temperature map, and another one as the humidity map. If it's land, decide if it's real land or river. 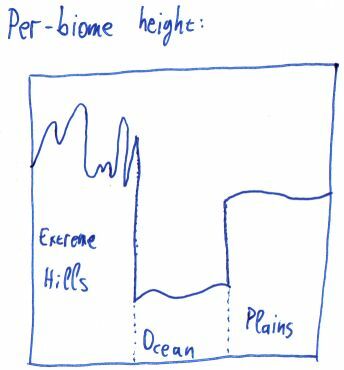 For the leftover land biomes, the two Perlin noises, representing temperature and humidity, are used to generate the biomes, as described earlier. Additionally, the temperature map is used to turn the Ocean biome into FrozenOcean, and the River biome into FrozenRiver, wherever the temperature drops below a threshold. The 1.7 MineCraft update brought a completely new terrain generation, which has sparked renewed interest in the biome generation. 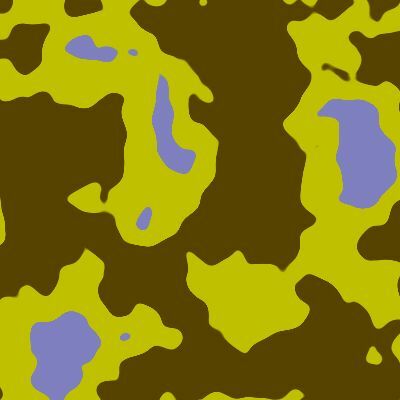 A new, potentially simpler way of generating biomes was found, the two-level DistortedVoronoi generator. The main idea behind it all is that we create large areas of similar biomes. There are several groups of related biomes that can be generated near each other: Desert biomes, Ice biomes, Forest biomes, Mesa biomes. Technically, the Ocean biomes were added as yet another group, so that the oceans will generate in approximately the size of the larger areas, too. For each column a DistortedVoronoi is used to select, which large area to use. This in turn results in the list of biomes from which to choose. 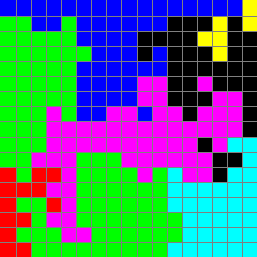 Another DistortedVoronoi, this time with a smaller grid size, is used to select one biome out of that list. 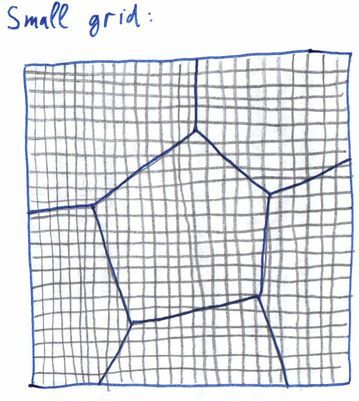 Additionally, the smaller DistortedVoronoi calculates not only the nearest seed's distance, but also the distance to the second-nearest seed; the ratio between these two is used as an indicator whether the column is in the "inside" or on the "outskirt" of the smaller Voronoi cell. This allows us to give certain biomes an "edge" biome - the Mushroom biome has a MushroomShore edge, the ExtremeHills biome have an ExtremeHillsEdge biome on the edge, etc. 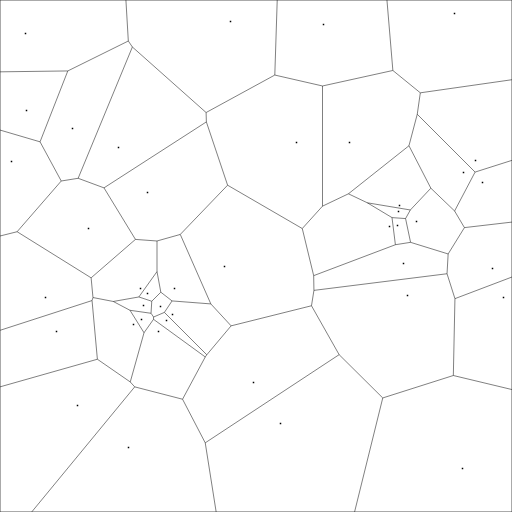 The images below illustrate the process with regular Voronoi diagrams, for clarity purposes. 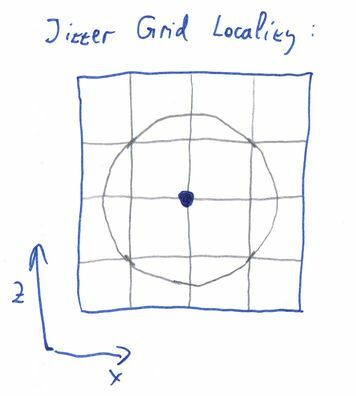 The real generator uses distortion before querying the small areas. 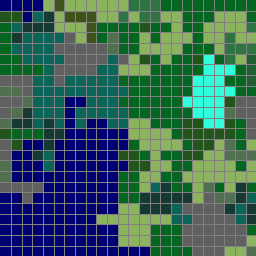 The following image shows an example output of a TwoLevel biome generator in Cuberite. 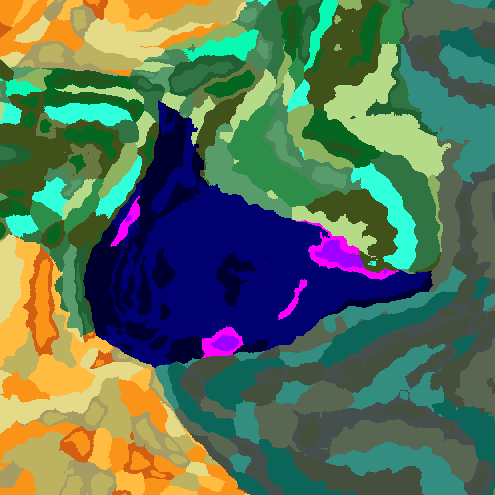 Note how the mushroom biomes (violet) have mushroom shores (pink) on their edges. 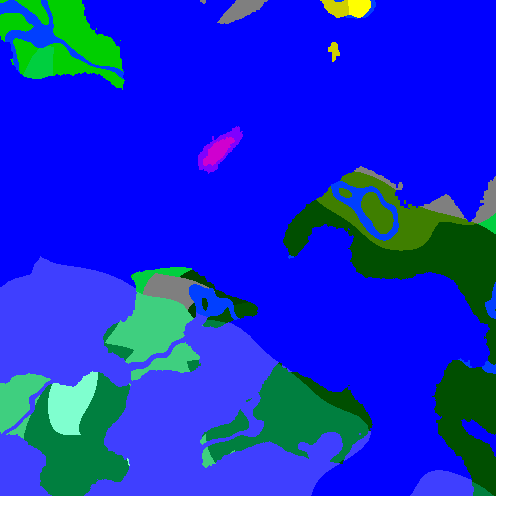 Note that rivers are currently not implemented in this generator in Cuberite, but they could be added using the same approach as in MultiStepMap - by using a thresholded 2D Perlin noise. This generator uses a completely new approach to biome generation. Internally, it uses 2D arrays of integers of varying sizes, and defines a few operations on those arrays. At various points in the generator's pipeline, the integers are interpreted as having a different meaning. At the first stage, they diffentiate between ocean and land. Later on they are interpreted as biome groups - ocean biomes, dry biomes, temperate biomes, mountain biomes or ice biomes. In the final stages they represent individual biomes, each number in the array representing the biome of a single-block-wide column in the world. Still, most of the operations are agnostic of this interpretation, they only "see numbers". 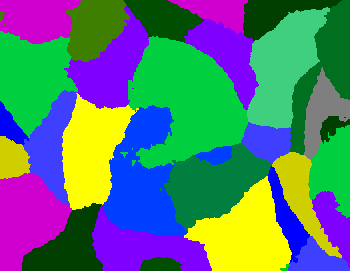 As you can see, the areas take a nice random-looking shape, but the edges are a little bit too noisy. There's where the second most important operation comes in: the "Smooth" slightly reduces the array size (N -> N - 2), losing the values on the edge of the array, and for the internal numbers it considers their 4 neighbors. If both the horizontal neighbors are the same and the vertical neighbors are the same (but not necessarily the same as the horizontal ones), the value is set randomly to either the horizontal or the vertical neihbors' value. 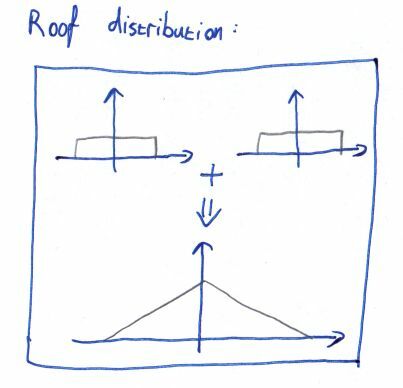 If both the horizontal neighbors are the same, the value is set to the value of those neighbors, otherwise if both the vertical neighbors are the same, the value is set to the value of those neighbors. In all the rest cases, the value is kept at its original. 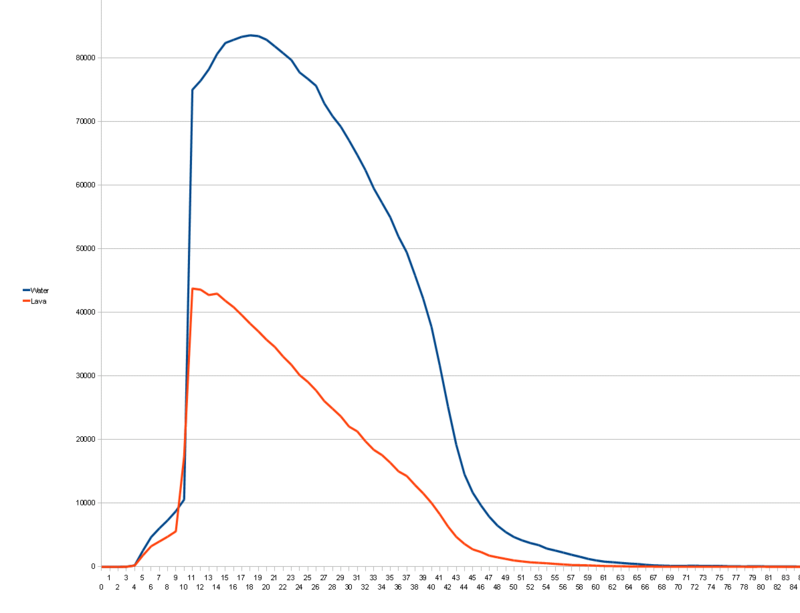 As you can see, the smoothing operation doesn't make much difference after its first pass, so it usually isn't used more than once after each zoom. One important thing to note is that both the Zoom and Smooth operations only output the numbers already present in the array, they don't create new numbers. This is important because it allows the late stages of the generator to grow indepent biomes next to each other without them "bleeding" into different biomes on their edges. The Grown generator uses several more supplementary operations, such as "AddIslands", "ReplaceRandomly", "River", "Beaches" and more. There isn't anything too special to those, they perform mostly trivial operations, manipulating the numbers in some way; the main power of the generator lies in the zoom and smooth operations. 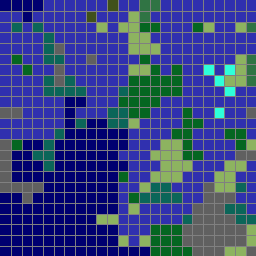 Perhaps noteworthy is the generation of rivers: it starts with the regular bitmap (only 0 and 1 used), zooms in and smooths for a while and then performs edge detection - a river biome is set in pixels whose neighbors are different, and no change applied when the neighbors are the same. Among other things, this means that there are actually two chains of array operations, and their results are combined together in the "MixRivers" operation. 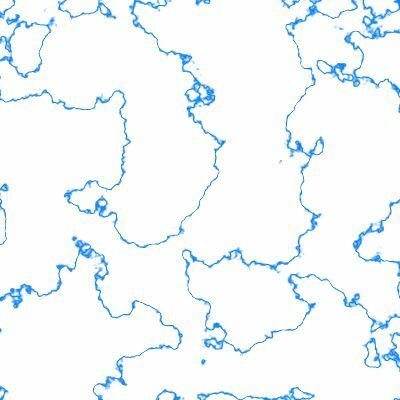 AddIslands - Adds a configurable (by percentage) amount of islands to ocean biome group. 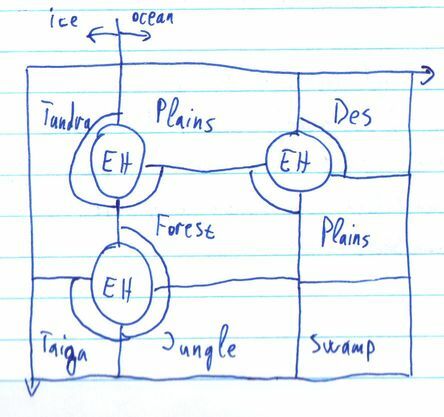 AlternateBiomes Mostly copies the first input, but where the second input has non-ocean biome group, turns the first input's biomes into their alternatives. Beaches - Any biome neighboring an ocean is turned into a corresponding beach. 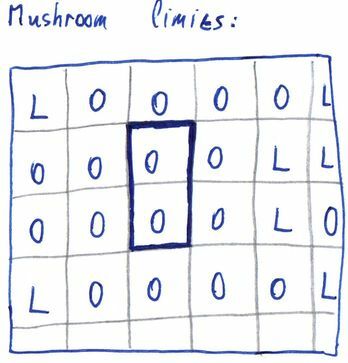 Biomes - Input is interpreted as biome groups, for each point a random biome corresponding to the group is chosen for the output. 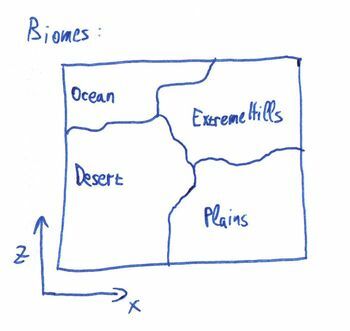 BiomeGroupEdges - Converts biome groups on an edge between two incompatible groups (such as desert and ice) into a neutral one (temperate). MBiomes Where the second input is zero, copies the first input's biomes; where the second input is nonzero, converts first input's biomes into their M variants. MixRivers Copies first input's biomes into the output, unless there's a river biome in the second input and a land biome in the first input - then it sets a river biome in the output instead. River - Somewhat of an edge detector - wherever the input has a different biome neighbors, sets a river biome; otherwise sets an ocean biome. 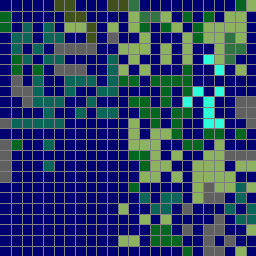 SetRandomly - Randomly sets points to a specified biome. The amount of changed points is settable as a percentage. Of further note is the existence of two sets of the IntGen classes, representing the individual operations. There are the cProtIntGen class descendants, which are used for prototyping the connections between the operations - it's easy to just chain several operations after each other and they automatically use the correct array dimensions. However, it is possible to further optimize the calculations by moving the array dimensions into template parameters (so that they are, in fact, constant from the code's point of view, and so highly optimizable). This is what the cIntGen class descendants do. Unfortunately, this optimization makes it difficult to change the operation chain - when a new operation is added or removed, the sizes for the rest of the chain changes and it has to be propagated manually. So the optimal strategy was to use the cProtIntGen classes to find out the best-looking combination of operations, and once the combination was found, to rewrite it using cIntGen classes for performance. As with biomes, the easiest way to generate terrain height is not generating at all - assigning a constant height value to all columns. This is again useful either for internal tests, and for worlds like MineCraft's Flat world. For a somewhat more realistic landscape, we will employ the good old 2D Perlin noise. We can use it directly as a heightmap - each value we get from the noise is stretched into the desired range (usually from 40 to 120 blocks for regular MineCraft worlds) and used as the height value. 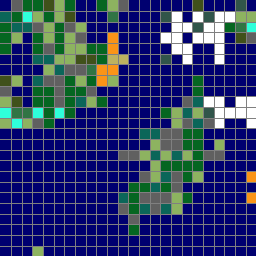 However, this doesn't play too well with the biomes we've just generated. If the biome says "ocean" and the Perlin noise says "mountain", the end result will be unpleasant. One key observation about this whole approach is that in order for it to work, the biomes must be available for columns outside the currently generated chunk, otherwise the columns at the chunk's edge would not be able to properly average their height. This requirement can be fulfilled only by biome generators that adhere to the second Expected property - that re-generating will produce the same data. If the biome generator returned different data for the same chunk each time it was invoked, it would become impossible to apply the averaging. As with the other generators, the composition generator category has its easy and debugging items, too. 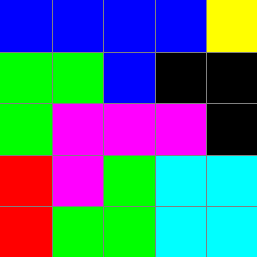 There's the "special" composition of "all the blocks are the same type", which fills the entire column, from the bottom to the height, with a single blocktype. This generator is useful when testing the generators in the other categories, to speed up the generation by leaving out unnecessary calculations. Another special compositor is a similar one, that fills all blocks with the same type, but the type varies for each biome. This way it's easy to see the generated biomes and possibly the heights for those biomes, as shown in the previous section on the height averaging screenshot. For a natural look, we need to put together a more complicated algorithm. The standard set forth in MineCraft is that the top of the world is covered in grass, then there are a few blocks of dirt and finally stone. This basic layout is then varied for different biomes - deserts have sand and sandstone instead of the grass and dirt layer. Mushroom biomes have mycelium in place of the grass. This per-biome dependency is trivial to implement - when compositing, simply use the appropriate layout for the column's biome. The next change concerns oceans. 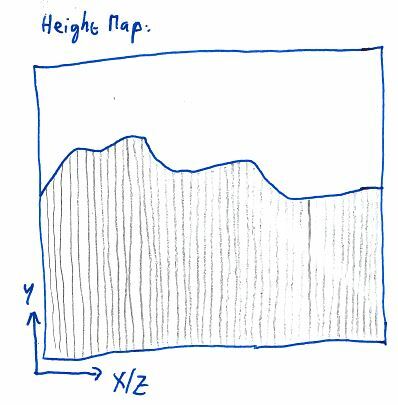 The generated heightmap doesn't include any waterlevel indication whatsoever. So it's up to the terrain compositor to actually decide where to place water. 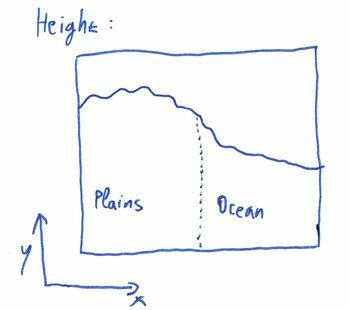 We do this by configuration - simply have a value in the config file specifying the sealevel height. 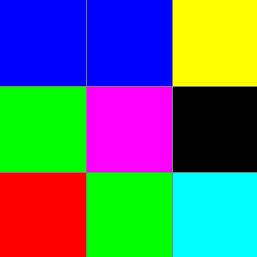 The compositor then has to add water above any column which has a height lower than that. 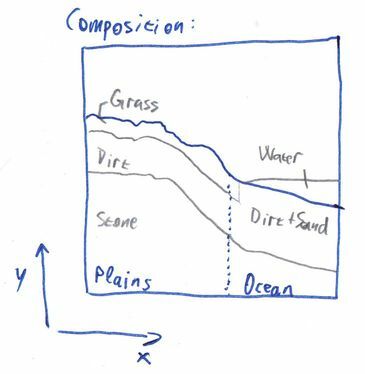 Additionally, the water needs to override per-biome layout selection - we don't want grass blocks to generate under water when the terrain height in the plains biome drops below the sealevel accidentally. So far we've been discussing only the Overworld generator. But MineCraft contains more than that. The Nether has a completely different look and feel, and quite different processes are required to generate that. Recall that MineCraft's Nether is 128 blocks high, with bedrock both at the top and the bottom. Between these two, the terrain looks more like a cavern than a surface. Not surprisingly, the Nether doesn't need a complicated height generator, it can use the flat height. However, the terrain composition must take an altogether different approach. The very first idea is to use the Perlin noise, but generate it in 3D, rather than 2D. Then, for each block, evaluate the noise value, if below 0, make it air, if not, make it netherrack. To make it so that the bedrock at the top and at the bottom is never revealed, we can add a value increasing the more the Y coord gets towards the bottom or the top. This way the thresholding then guarantees that there will be no air anywhere near the bedrock. 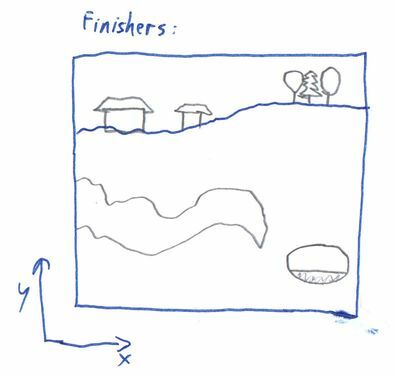 Finishers are a vast category of various additions to the terrain generator. They range from very easy ones, such as generating snow on top of the terrain in cold biomes, through medium ones, such as growing patches of flowers, complicated ones, such as placing trees and generating caves, all the way to very complicated ones such as villages and nether fortresses. There is no formal distinction between all these "categories", the only thing they have in common is that they take a chunk of blocks and modify it in some way. Snow is probably the easiest of the finishers. 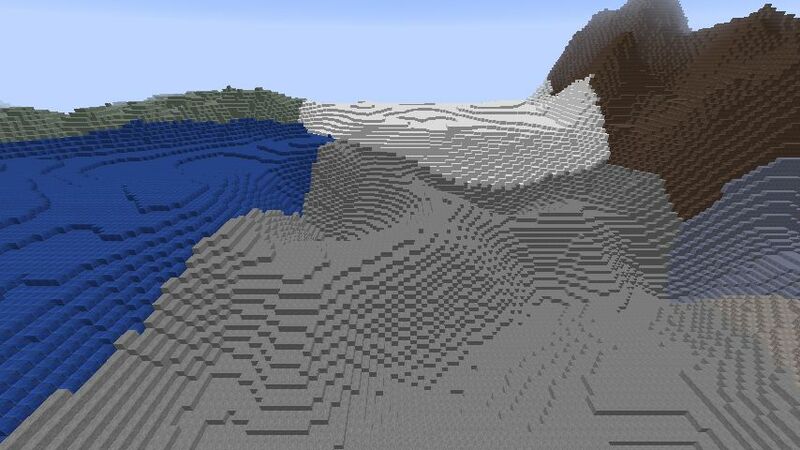 It generates a block of snow on top of each block that is on top of the terrain and is not marked as non-snowable. It checks the chunk's heightmap to determine the top block, then checks whether the block supports snow on its top. Rails, levers and tall grass don't support snow, for example. Another example of an easy finisher. This scans through the world and turn each water block on the surface into an ice block if the biome is cold. This means that any water block that is under any kind of other block, such as under a tree's leaves, will still stay water. Thus an additional improvement could be made by scanning down from the surface block through blocks that we deem as non-surface, such as leaves, torches, ladders, fences etc. Note that Cuberite currently implements only the easy solution. Most worlds in MineCraft have lava lakes at their bottom. Generating these is pretty straightforward: Use the user-configured depth and replace all the air blocks below this depth with lava blocks. Note however, that this makes this generator dependent on the order in which the finishers are applied. If the mineshafts generate before bottom lava, the mineshafts that are below the lava level will get filled with lava. On the other hand, if bottom lava is generated before the mineshafts, it is possible for a mineshaft to "drill through" a lake of lava. Cuberite doesn't try to solve this and instead lets the admin choose whichever they prefer. There are generators for specific kinds of foliage. The dead bushes in the desert biome and lilypads in the swamp biome both share the same generating pattern. They are both specific to a single biome and they both require a specific block underneath them in order to generate. 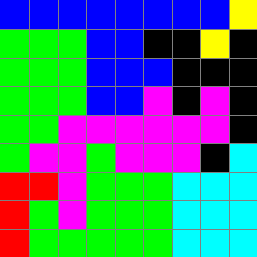 Their implementation is simple: pick several random columns in the chunk. If the column is of the correct biome and has the correct top block, add the foliage block on top. In order to generate the same set of coordinates when the chunk is re-generated, we use the Perlin noise's basis functions (the ones providing the random values for Perlin cell vertices). These basically work as a hash function for the coorinates - the same input coordinates generate the same output value. We use the chunk's coordinates as two of the coords, and the iteration number as the third coordinate, to generate a random number. We then check the biome and the top block at those coordinates, if they allow, we generate the foliage block on top. Another example of specific foliage is the tall grass in the plains biome. There are quite a lot of these tall grass blocks, it would be inefficient to generate them using the random-coords approach described above. 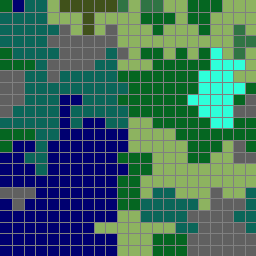 Instead, we will use a 2D Perlin noise again, with a threshold defining where to put the grass and where not. This scheme can be used to produce clumps of flowers, when we select the 2D coords of the clump center on the top surface of the terrain. We simply generate the 2D coords of the foliage blocks and use the terrain height to find the third coord. 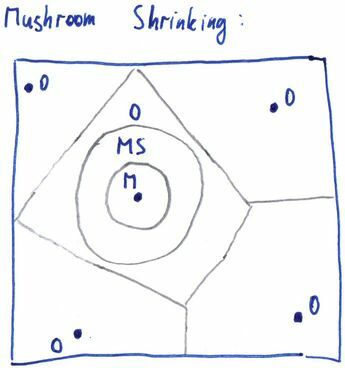 If we want to generate clumps of mushrooms in the caves, however, we need to generate the clump center coords in 3D and either use 3 offsets for the mushrooms, or use 2 offsets plus searching for the closest opening Y-wise in the terrain. 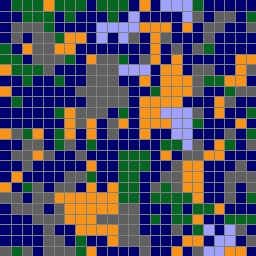 Note that the clumps generated by this scheme may overlap several chunks. Therefore it's crucial to actually check the surrounding chunks if their clumps overlap into the currently generated chunk, and apply those as well, otherwise there will be visible cuts in the foliage along the chunks borders. Water and lava springs are essential for making the underground quite a lot more interesting. They are rather easy to generate, but a bit more difficult to get right. Generating simply means that a few random locations (obtained by our familiar coord hashing) are checked and if the block type in there is stone. Then we see all the horizontal neighbors of the block, plus the block underneath. If all of them except one are stone, and the one left is air, our block is suitable for turning into a spring. If there were more air neighbors, the spring would look somewhat unnatural; if there were no air neighbors, the spring won't flow anywhere, so it would be rather useless. Cuberite uses an approximation of the above curves to choose the height at which to generate the spring. 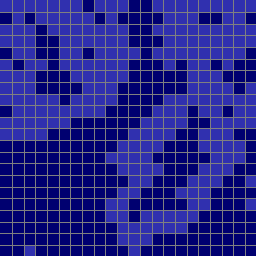 Much of the terain generation consists of doing the same thing for every single column or block in a chunk. 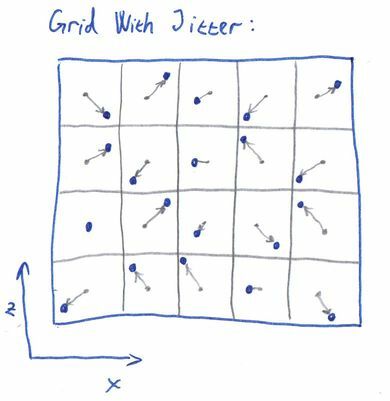 This sort of computation is much faster on a GPU as GPUs are massively parallel. High end GPUs can execute up to 30,000 threads simultaneously, which would allow them to generate every block in half a chunk in parallel or every column in over 100 chunks in parallel. A naive comparison suggests that a 800MHz GPU with 15,000 threads can execute parallel code 250 times faster than a 3GHz CPU with 128 bit SIMD. Obviously we want to harness that power.